Years ago, Techni-Grip was established within an aerospace manufacturing facility that was trying to solve a number of internal work-holding challenges inherent to CNC mill work. 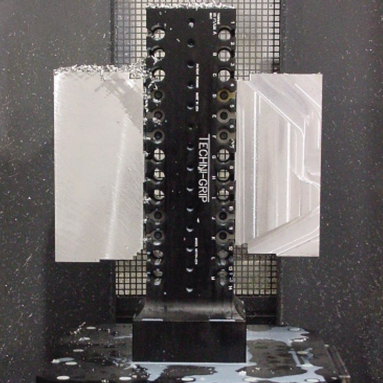 Some of these situations included part stability when in the cut, dimensional repeatability, reducing raw material requirements for work-holding purposes, running multiple workpieces on the same fixture, reducing set time with quick change through repeatable locating and the ability to swap fixtures from machine to machine without complications. To solve these problems, Techni-Grip came up with a work-holding system having a pin-and-hole design that would enable consistent positive location and that works by centering two 60-degree dovetails on the locating pin. The dovetail cut provides exceptional gripping strength with minimal clamping pressure. By minimizing material requirements to hold a workpiece and by reducing clamping pressure typically needed for traditional vises, Techni-Grip decreases the likelihood of material distortion and reduces scrap rates from parts coming loose. Varying clamping points on the Techni-Grip work-holding system allow a much broader range of raw stock that a single fixture can hold, and enable multiple operations and various parts to be set up on a single fixture. This flexibility contributes to more versatility and the ability for this product to be applied to a variety of applications. The centered locating pins also let customers easily move a job from one fixture to the next, or one machine to the next, with consistent and repeatable positive location. 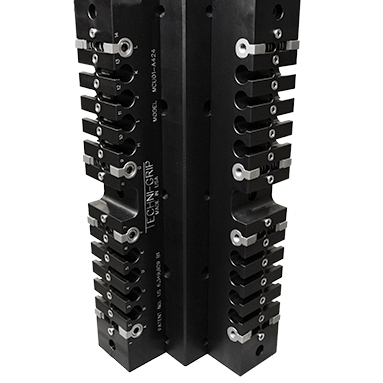 This solution is made possible because all of the Techni-Grip work-holding systems use the same self-centering dovetail clamps and locating pins with equal distances. This pin-and-hole design ultimately reduces setup times and has been shown to provide up to 57 percent reduction in direct machining and fixturing costs. The dovetail clamps and locating pins protrude 0.085 inch above the base. In most cases, it is recommended that only 0.125 inch of excess stock be required to hold even large parts, with some applications using as little as 0.100 inch. This leaves 0.015- to 0.040-inch clearance between the bottom of the material to the top of the clamps and pins, reducing obstacles in the toolpath and allowing the part to be milled completely through in one operation without ever coming in contact with the clamps and pins. 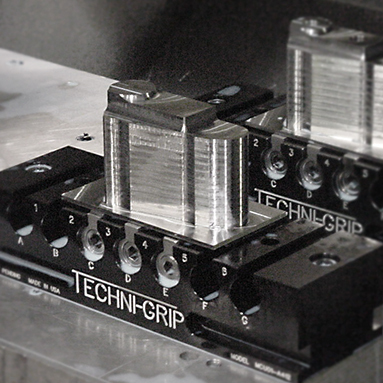 Unlike a fixture with a fixed dovetail, if a mistake is made where the endmill comes in contact with a clamp, Techni-Grip’s unique self-centering feature allows for individual clamp assemblies to be replaced, as opposed to having to replace the whole fixture. Lean manufacturing environments appreciate the standardized processes afforded by the Techni-Grip work-holding system. All stock is prepped using the same methods, all jobs are set up the same, and all parts are held the same. With fewer operations, reduced tooling design requirements and lower fixturing costs, overall expenditures are reduced. Although some may view prepping a 0.125-inch dovetail as an additional operation, even when using a traditional vise, the stock must be squared prior. With Techni-Grip, one is simply changing the prep operation versus adding an operation. After completing the system and testing it over a year’s time, Techni-Grip began receiving requests from manufacturers and in 2000 the owners patented and marketed the Techni-Grip system design. The Techni-Grip work-holding system works well in aerospace applications where tight-tolerance requirements are required, but it can be used in many other industries, including automotive, medical, oil/energy and marine, to name a few. If a manufacturer is milling any type of metal or plastic and has 0.125 inch of excess material, the Techni-Grip system can be implemented. 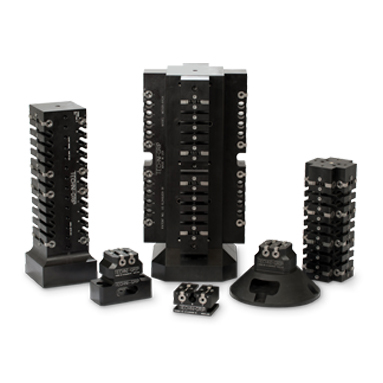 Techni-Grip offers various fixtures to be utilized in different applications and multi-axis operations. Its expansive line of universal fixtures can be used individually or in multiples using different configurations, such as side by side or in a string for larger jobs.